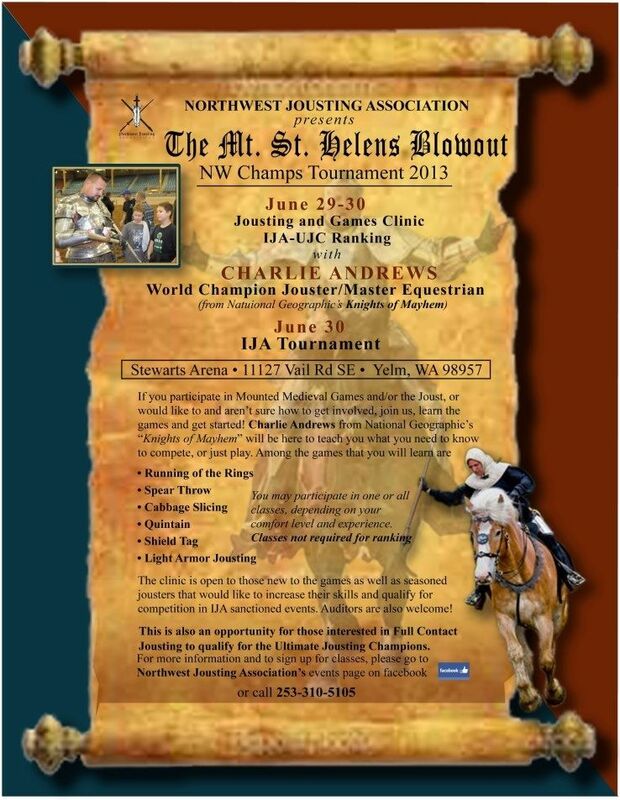 On the weekend of June 29 - 30, 2013, there will be a jousting clinic and tournament sponsored by the Northwest Jousting Association featuring Charlie Andrews of the Knights of Mayhem as the main instructor. The event will take place at Stewart's Arena, 11127 Vail Rd. SE, Yelm, Washington 98957 USA. The clinic is open to ALL ages and horses, and auditors are encouraged. You can find out more about the clinic and tournament on "IJA Ranking and Clinic and Mt. St. Helens Blow Out Tournament-NW Champs 2013" Facebook page.